A wintry mix of indoor and outdoor activities. During my childhood, a snowfall meant that I’d be outside for hours until my lips were blue and feet were nearly frostbitten. But that was my idea of winter bliss. My daughter, however, prefers to stay bundled up in her pink snuggie enjoying the heat our family room. If this scenario sounds familiar, heed the following advice to keep your kids active this frosty season. Visit a local ice skating arena. Winter is the perfect time to get your kids on ice skates. Take advantage of a nearby park system that oversees ice skating on a frozen pond or check out the indoor ice skating rinks in your area. Try something new, like skiing or snowboarding. If you have a 4th grader, now is the time to get your tyke on skis or a snowboard, especially if you live in the tri-state area. Participate in the Ski for Free 4th Graders program in which 4th grade kids from New York and New Jersey ski or ride free at the majority of New York Resorts when accompanied by a paying adult. Visit www.44free.com for details. Blast the iPod for a family dance-off session. Who needs to watch Dancing with the Stars when you can have your own dance competition in the comfort of your own home? Shut that TV off, blast your favorite playlist and bust a move. Your kids will be thrilled with such impromptu fun. Take advantage of community indoor pools. Many YMCAs offer short-term memberships and open swim hours on the weekends. Kids love packing up their bathing suits, towels and goggles for some summer-like merriment in the heart of winter. Get creative with snow angels, snow forts and snowballs. Most kids can’t resist the timeless magic of a blizzard. Bundle them up and give them the freedom to build the biggest snow fort they can. Create a family of snow angels that resembles your own. If a snowball fight breaks out, join in. There’s nothing like the breathtaking silence after a snowfall. Grab your kids and pull on your boots, hats and gloves before taking a collective stroll in your neighborhood. Everything looks and sounds different with flurries in the air. While walking, see who can catch the most snowflakes on their tongue. The season offers people the chance explore local surroundings in a different way. Gather the kids for a family hike through a nearby park to look for animal footprints in the white veil of snow throughout the trails. Try to decipher what made the prints. Was it a deer, a dog or a raccoon? Let your children channel their inner detectives to decide. Hit up the community center. 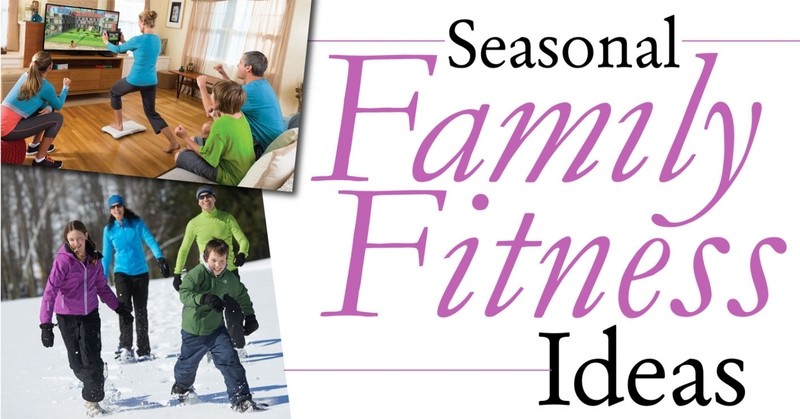 If you can’t sell the winter hike idea to your clan, check out the indoor tracks and open recreation time at local YMCAs and school gymnasiums. Add an element of competition, too. For example, see how many laps the kids can run around the track or how many baskets they can make on the basketball court within a minute. Bottom line: Use open indoor space and get moving. Sled away the chilly day. Who can resist the thrill of barreling down a snowy hill? With sledding gear in tow, head to the nearest slope with your kin. Some families can take advantage of a hill in their own backyards, while others make do with their driveway or an available slope at a park, library or school. Given the rising child obesity epidemic, this season is not the time slack off and let kids turn into full-fledged couch potatoes. By following a few of these tips, your entire brood can stay active, keep healthy and experience seasonal fun. Now that’s something worth moving for!